All Are Precious In His Sight: Whew! What a trip this has been! 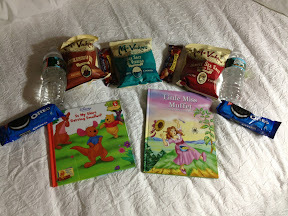 We left Austin Wednesday early afternoon and arrived in Baltimore Wednesday evening. 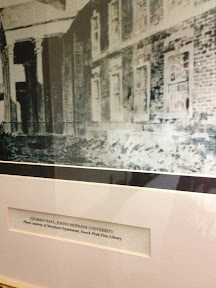 We just thought Selah was difficult to manage--we ain't seen nothin' yet!! The wrangling began going through security. We requested handicapped travel, but they didn't do anything special except allow us to board in one of the first groups. 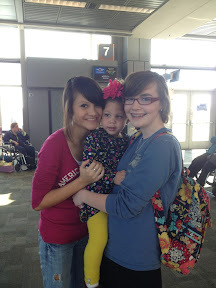 We chased Selah around the Austin airport for almost two hours prior to boarding. She climbed stairs and tried to jump over railings and through windows. One of the hardest things with Selah is that other people (who don't know what a miracle girl she is, who don't have a clue about her multiple brain malformations, seizure disorder, mood/behavior disorder, etc.) and they silently judge. 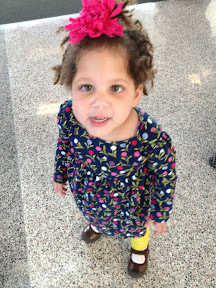 People, including airline staff and airport security, just don't understand why we can't get this girl under control. And, I'm sure in my pre-parenting days, I would have thought the same thing when seeing an out-of-control-wild-child. I used to think all ill-behaved children just needed better parenting. Whatever. God has taught me that some of His children would act certain ways even if JESUS were their earthly-in-the-flesh daddy!!! 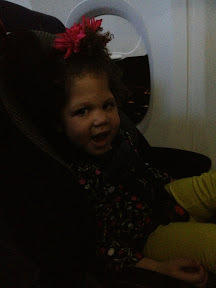 Anyway, we boarded our flight, strapped Selah into her car seat, then promptly apologized to the poor woman sitting in front of us. 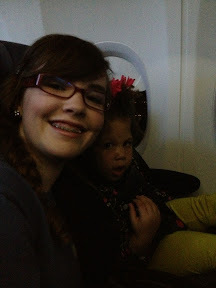 Selah fiercely and wildly kicked the back of her seat. Over. And over. And over again. The more I tried to stop her, the more Selah kicked. Then the not-so-kind older couple in front of us (who weren't having their seat backs kicked) continued to glare and shake their heads. Jesus help them understand and have compassion. 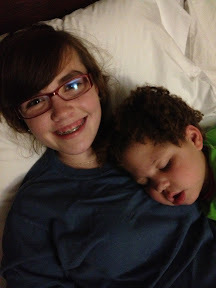 And help me, when I'm their age, to reach out to the exhausted mom and wild child to help instead of hurt. 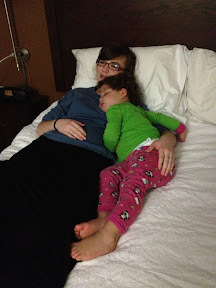 Finally, after an hour of Selah raging uncontrollably, she gave in and fell asleep. But that only lasted about 45 minutes. Praise the Lamb for those 45 minutes of peace though!!! 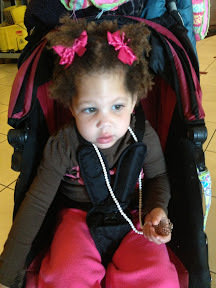 I had consulted with Selah's neurologist prior to travel, and he gave us his advice on medications to use to help calm Selah. 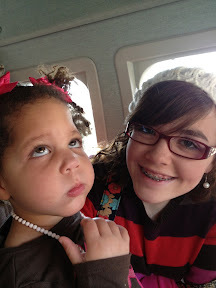 We have Selah her prescription medications before and during the flight, but this girl seems to just not be affected by medications the way a typical child would. 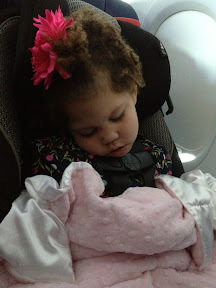 I walked the narrow airplane aisle with Selah countless times, to the point where I could identify passengers, but let's just say God has this girl living on a ranch in the country for a good reason. Praise Him for wide open spaces and plenty of roaming territory!!! No one on that flight could have been happier to land than ever before. Oh the stress burns in my shoulders just typing about it! So, let's move to happier subjects. 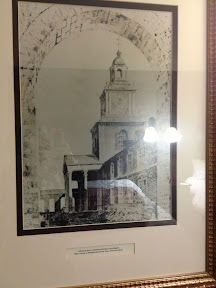 Our hotel room even has a Johns Hopkins Hospital historical print. Perfect, I said. Selah slept between Mattie and Meribeth our first night in Baltimore, even though the hotel set up a pack-n-play for her in our room. She only slept in it for about 45 minutes. :-). Praise God Mattie and Meribeth are with me. It takes all three of us to make it through each hour with Selah. I seriously cannot thank them enough for all their help. 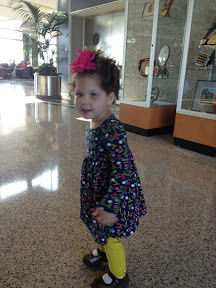 We took the hotel shuttle to rent a car so we could make it to Selah's various appointments. Selah rolling her eyes for Mom's never-ending photos! 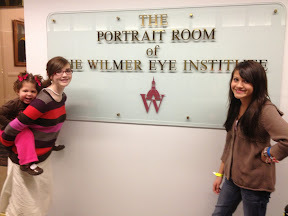 It took longer than expected to get our rental, so we skipped lunch and rushed over to Selah's neuro ophthalmology appointment at the Wilmer Eye Institute in Johns Hopkins Hospital. I'm so impressed with this facility. First of all, being in the top neurology hospital in the world brings a comfort and peace that can't be described. There are neuro patients everywhere, so it feels like Selah fits right in, instead of feeling like a behavior outcast most everywhere we go. 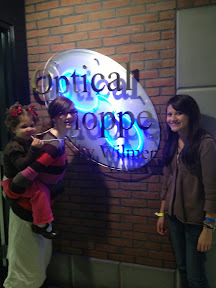 Second, Selah's ophthalmologist was SOOOOOO thorough. We spent about 3 hours being examined. The doctor even carefully reviewed Selah's images from her MRI's and CT scans, and she pulled me into the room to show me her findings. 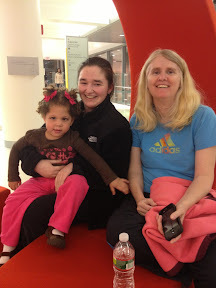 Selah has underdeveloped optic nerves, known as optic nerve hypoplasia, due to her holoprosencephaly. This often causes blindness or severe vision loss, but Selah appears to have what this doctor believes is normal vision. Miracle again! 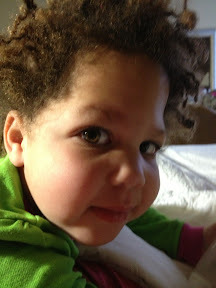 The doctor also recommended not to use the dilating drops that Selah's Austin ophthalmologist prescribed because it appears that Selah is using both eyes equal amounts and both eyes have equal amounts of mild strabismus, which is not even worthy of treating unless it worsens. Hallelujah!!! After Selah's appointment, about 5:30PM, we had the honor and blessing of meeting up with another adoptive family whose son, Jesse, is a patient of Dr. Carson's. Jesse has been in Johns Hopkins Hospital for 9 weeks now, but he's supposed to get to go home tomorrow, praise the Lord!!! This precious family has several kids (adopted with special needs) whose behaviors resemble Selah's. Peace, love, support, and acceptance enveloped my heart as God blessed us with a couple of hours with another mom (and her daughter for our girls) who lives such a similar life and is unfazed by Selah's behaviors. Thank you, Jesus! Please pray for Jesse and his family as they almost lost him several times. He's now trached and requires 24/7 skilled nursing care. Many of his doctors say he shouldn't be alive, and he won't survive should he get another severe respiratory infection. God knows differently and He's shown Himself boldly through Jesse. After this divine meeting with Jesse's mom, we headed back to our hotel. (Oh, I got a ticket for parking in a non-parking spot. Oops!!! Had no idea--neither did the security guard. The guard also commented that the police usually ticket and tow, so we praised God for allowing our vehicle to stay in that non-parking spot!!!). Oh, and our key fob on the rental didn't work, and it's this strange key that doesn't have a "real key", just a plastic nub deal. Probably some city slicker deal this country girl is clueless about, just like the non-parking spot I would have never identified! Anyway, we couldn't get back into the vehicle at first, but discovered the key fob has a little switch knob deal that slides to release a real key. Perhaps for emergencies like ours. Ugh! Anyway, we made it safely back to our hotel. 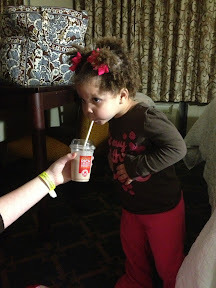 We discovered a Wendy's across the street and drive through to get Frosty treats to reward the girls. 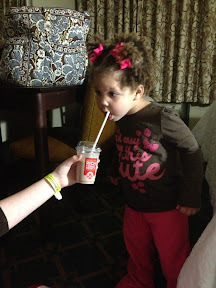 Selah had never tasted a Frosty. 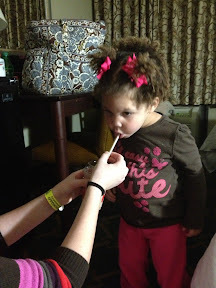 Let's just say she LOVED it!!! She patted her belly and signed and shouted MORE, MORE, MORE!!! Then it was bath and bedtime. Selah's sleeping next to me tonight. Praying for some good rest and some awesome doctor's appointments tomorrow! Pray that I'll be able to find a parking garage and the right buildings tomorrow. 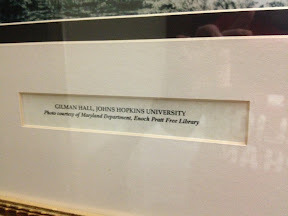 Johns Hopkins is massive and there's the old part and the new part. It's very much like a university campus, so getting around without a tour guide as a first-time visitor is kind of crazy, to say the least! 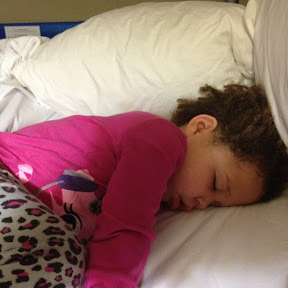 Selah will see a sleep specialist at Noon and Dr. Carson at 2:30. Pray for wisdom and guidance and good discussion between us all on how to treat Selah to give her the best life and potential possible. Thank you so much! Nightie night! PS. I posted this via my iPhone, so please forgive typos and autocorrections that don't make sense. Too exhausted to proof read!